Xender is also available on the Apple App Store, fortunately for the iOS users. Now they won’t have a hard time getting stuff from their friends with Android devices. Let’s see how to use Xender for iPhone. 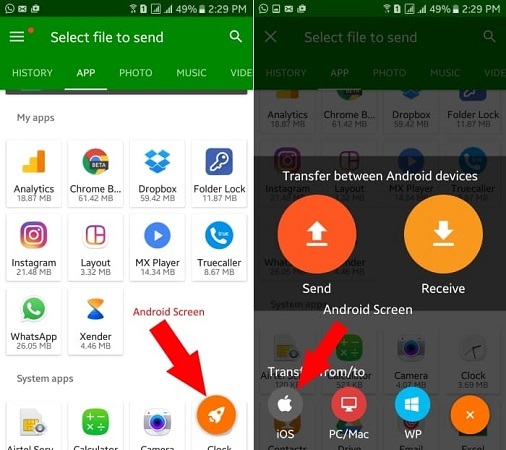 There is no easier way to transfer files from an Android phone to an iPhone than using this app. Let’s see how it’s done. Open the App Store and search for Xender. Find it and install it. Connect your iPhone to the hotspot of the Android device. Create a group from the Android device and join that group. Both the devices will connect and you will be able to transfer files. That’s it. You will be able to share every type of file except for the apps. Now, you can use this with iPad and iPod touch too to share files. If you need more help, then go to APK Pie.